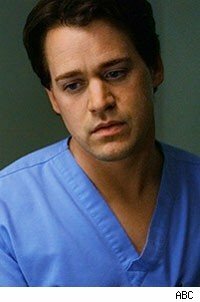 My little sister loves George O'Malley from Grey's Anatomy. I think she is a tad obsessed and I know she cried profusely when the character dramatically died. (I'm seem to remember there was also some swearing and vowing never to watch the show again). So what do you do for an obsessed 20 something year old sister when you can't send her the real George gift wrapped for Christmas as she requested on her Christmas wish list? Make a cuddly substitute of course. The basic doll. Notice that it is not anatomically correct. (He has no fingers or toes). However, his arms do move! I deliberately didn't go for an adult looking doll as I wanted cute and cuddly and hug-able. This doll pattern was taken from Better Homes and Gardens: Craft Collection (pictured below). As you can see below, the original doll pattern is actually for a Japanese girl doll. I have actually knitted this pattern twice and both times, it has ended up being a male doll. When my son was about two, he decided he needed a doll because his sisters had lots and so I made Man. Man was a brown doll with curly black hair and removable clothes, a knitted T-shirt and pants. My son carried him around everywhere, however, the doll was usually naked. He had mastered removal of clothing but not re-dressing.One day however, Man got left in the hardware store leading to an inconsolable small boy and a frantic retracing of our steps. But Man was gone. I often wonder who picked up a naked knitted boy doll and where he ended up. I do still have the clothes though! This is the basic doll pattern I used to make George. Notice that the George doll has had a gender change! This doll pattern is a quite a good pattern for novice toy knitters as there is not a lot of fiddly sewing up. The legs, body and head are knitted in one piece, then the soles of the feet and the arms. George's finished height is about 40 cm tall. George was knitted using flesh and pale blue 8 ply acrylic yarn, using a set of four 3.25 mm needles as the body and head are knit in the round like a sock. The arms, legs and soles of the feet were knitted using only two of the needles. The scrubs are adapted from a pattern for a jumper and pants for a similar sized teddy bear. Close-up of the eye. These hand embroidered eyes are child safe and allow much more realistic expressions. The hardest parts of making any knitted doll 'live' so to speak are the face, particularly the eyes, and the hair. I often used embroidered eyes on my knitted dolls. This is for two reasons. The first is that they are child safe. The second is that you can produce a quite realistic eye. The basic inspiration for these knitted eyes comes from a book I picked up one day second hand at a Sunday market; Easy to Make Knitted Toys by Joy Gammon. The Harry Potter doll has the same types of eyes. You just scale up to the size of the face, by using thicker or thinner wool or embroidery cotton to embroider with. The eye is constructed using a combination of small chain stitches and back stitch. A subtly variegated wool can give a really interesting iris. Unfortunately, these days, George has pride of place on a high shelf as my sister's dog eats toys for fun and he is too precious to chew. I think that everyone cried when George died. Cute gift though.